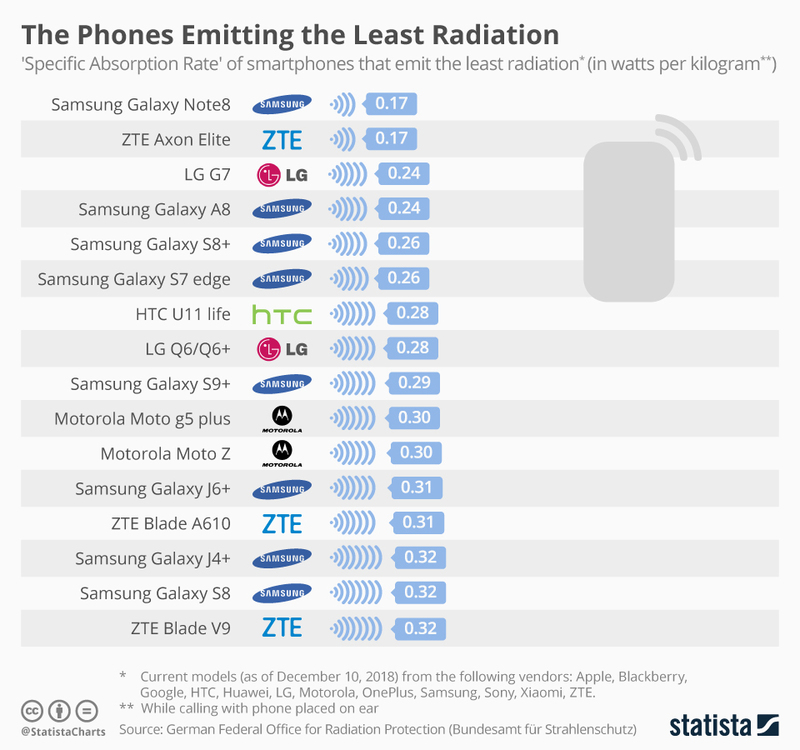 List of High and Low Radiation Emitting Smartphones Is Out, Samsung & Apple Have a Huge Presence in It! Today, it’s possible to see someone survive without the basic needs of life, but not without smartphones. Smartphones have become THE most significant part of our everyday lives. From professional work to academic work and everyday tasks, these handheld devices have brought everything in the palm of our hands. However, nothing is perfect and everything comes with a price. Everything has its pros and cons. In case of smartphones, the cons are basically the emitted radiations from the cell phones. These radiations can have long-lasting effects on the health of users. Although a comprehensive longitudinal research on the radiation effects is difficult to conduct and analyze thoroughly, still the data that can be gathered can be useful for the users. Bundesamt für Strahlenschutz, The German Federal Office for Radiation Protection, managed to gather a ton of useful data, thanks to the wide set of phones available there. Information such as emitted radiation levels were determined. A criteria was also set. The absorption rate was to be measured in watts per kilogram. It was found out that Samsung Galaxy Note8, out of all the smartphones, generated the least amount of radiation (0.17 watts per kilogram, to be more specific). In fact, a number of Samsung phones are known for creating low levels of radiations. Apple, on the other hand, has a couple of iPhones known for generating high levels of radiations. 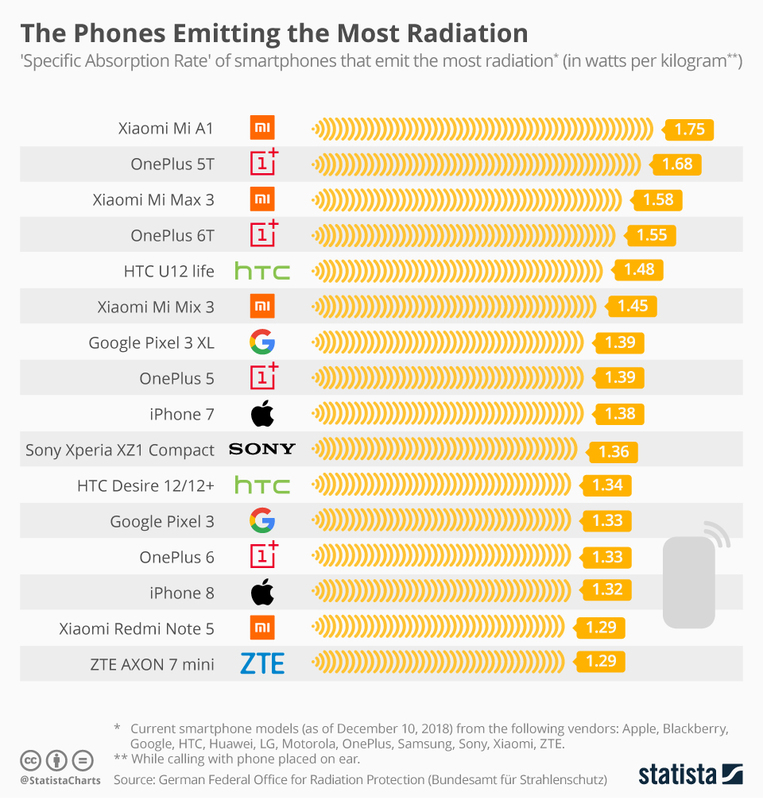 However, Mi A1 (from Xiaomi) takes the cake in terms of emitting highest levels of radiations. Following it in that list is yet another Chinese Cell phone, called OnePlus 5T. Apple Phones which are featured quite high on the table are iPhone 7 and 8. Speaking about high and low radiation levels, it should be noted that there’s no set level which can be considered “safe”. However, “Der Blaue Engel”, the German certification for environmental friendliness makes sure to certify only such phones whose absorption rate is less than 0.60 watts per kilogram. Here is a list of a number of smartphones, ranging from “safe” and low level radiation emitters to high and potentially hazardous level radiation generators. Thus, it’s evident from the table that Samsung Phones generate such low level radiations that are barely half of the specified benchmark (0.6). On the other hand, Xiaomi and Apple phones’ generated radiation levels are more than double of that benchmark. Although these insights would probably not have any effect on the sales of either Samsung or Apple phones right now, the pursuit of a safer lifestyle can surely have a huge role to play in future.